Anyone heard of or know anything about this vanished village that was on the Blantyre farme road? The road sign was still there until a few years ago but its gone now. Yeah, I know Fin Me Oot - a small miner's village more properly called Caldervale, due to it being on the banks of the Rotten Calder. The nickname arises from the fact that it's not the easiest of places to find, although I have no idea if it was known as Fin Me Oot whilst still an active village. My dad first told me about it about 15 years ago, used to take my dog a walk down there all the time. Only a few fragments of buildings survive, most having been swept away long before I first got there. Looks like it was made up of simple brick rows, of which only one structure remains, although it looks possibly too small to me to have been a house, and only a small corner of it survives. The entrance from Blantyreferme Rd is fairly easy to spot, it's near the railway overbridge and Clydeway Golf Range. You can identify it by a public right of way signpost next to the gate, and a large sign that now warns of the dangerous bridge. The dangerous bridge is a little green pedestrian effort - from Fin Me Oot, you go under the railway and down alongside it till the bridge carries you over the Rotten Calder. It's dwarved by the railway alongside, carried over the river on a massive embankment, the bridge for which resembles a long canal tunnel! This was once the route the miners took to work, with the collieries of Newton at the top of a steep path on the other side. Again, only the bings and a few scattered structures remain of the pit workings. The bridge itself is still passable, but has been condemned and the middle section has no floor! Those brave enough can still climb along on the side railings! Been meaning to take pics of the place for ages, this seems like a good excuse to get down there! Will try to sort some out when I get back from Amsterdam next week. Incidentally, some old fellas rescued the name from oblivion by making a bench there, and painting "FIN ME OOT - CALDERVALE" on the back of it - is this the sign that you mean has gone now? Have yet to find any pics of the place when still inhabited, would be great to see them. Anyone travelling on the railway line between Newton and Uddingston gets a birds eye view of it if they look to the north. The sign I was referring to was a road sign. Very much old style and more propped up than in place. I haven't been there for years and I will let you know if I can go with you if that is ok. BTW I think the building you are referring to was the electricity sub. station which was still there after the village. The bridge is now open again though the sign on the Blantyre road indicates otherwise.I`ve got some photos I`ll look out. Gary,I have only ever seen one pic of the village.If you ever come across a white haired stocky man of about 70 odd with two mongrels (one black and one brown) then ask him about Fin Me Oot. His name is Eddie and he carries a picture in his wallet of his mother and grandmother standing in the doorway of their cottage. He takes his dogs round that area most days. He has promised to drop by my house one evening and let me scan it.....I`ll keep you posted on that. If you go along Blantyreferme Rd towards Blantyre itself, then just before you cross the railway line, there was an anti-aircraft gun emplacement on the right - most of the buildings and structures are still there, albeit half buried and vandalised. Might have some pics lying around I'll look out, but never got round to a proper photographic survey before summer and the undergrowth returned! Apparently, the accomodation block for the gun site was next to the road, so appears to have been buried under an embankment which now follows the road. How far is the emplacement from the road? I was walking there fairly recently, and had a scout over the area beside the road, between the buildings at the road down to the golf driving range and the railway, where the road passes under at lights. All that I found was the foundations of some buildings, where the farmer appeared to be keeping spare machinery, and a bit further from the road there was just some rubbish dumped (with tractor or similar tracks) and then the ground became too uneven to suggest there was anything man-made further on, so I abandoned. Plus, the big dugs from the building were becoming unhealthily interested in me. Edit: Just saw your post made while I was typing, so guess I was just short of the interesting bit. Looked at my old(ish) streetmap, and it shows Caldervale just south of the location, and beside the Rotten Calder. Last edited by Apollo on Sun Jun 12, 2005 11:20 pm, edited 2 times in total. take a walk down the rubble road to the bottom Where the fish farm is. Hang a left at the bottom car park and walk up the hill. It's in the opposite direction to the golf range and the traffic lights at the railway bridge, about half a mile on - if you turn around and head back towards Blantyre, you'll pass the turn off on your right for Hallside and Newton. Ignore this, and also on your right, you'll see the gates and track that lead down to Redlees Quarry - a fascinating location until it got taken over as some dodgy trout fishery. If you're on foot, go in the gates and follow a path through the hedge immediately on your left. This follows the top of an embankment - about halfway along it, a path down to your right enters the emplacement, it can be hard to see when it's overgrown! If you're in a car, keep on the Blantyreferme Rd and it starts to rise to cross the railway line - on your left should be the entrance to some sports pitches with Bothwell Castle on the horizon - across the road from this entrance is a wee lay-by with space to park a car or two. Go in there and you can join the path at the other end of the embankment. That another reason I'm suffering the mild pain of irritation not knowing it was there. I've lifted the grid ref off the rcahms entry, so provided it's reliable, that will land me on top of it when I drag myself out. Now, to go now and satisfy curiosity, leave it 6 months until the vegetation dies back? If you were going to take pics, then it probably is best to wait till at least September now - I've known about the place for about 15 years and the level of tree growth in that time has been quite something, couldn't believe it when I visited again recently after an absence of a few years. But any time of year is good for just a plain old poke around, and pics of the interiors of the buildings are probably better taken at this time of year, since some of them are fairly prone to a good few inches of groundwater sitting in them. The pic is of his little sister,mother and granny in front of the row of houses.I had always pictured them in my mind as being a lot smaller than they are. 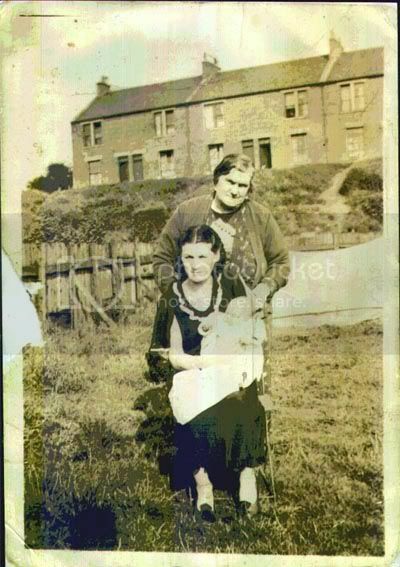 This pic was taken in 1935 he thinks.If you fancy a higher resolution scan then PM me with your email addy. Fantastic, I had no idea they were such substantial houses - that's the first pic I've ever seen of the place, and if he says 1935, the first indicator of when they were there! Just trying to figure out where it is now - is that down where all the rubbish gets dumped I wonder?? I wondered if there were two rows of houses...one running alongside the river where the rubbish lies and the other between the old bench ( now vandalised unfortunately ) and the railway tunnel. I`ll ask him next time I bump into him. All I know of him is that his name is Eddie and he`s from Blantyre.He worked as a farm labourer on the local farms before doing his National Service in the Fifties and he`s an absolute mine of information about the area between Blantyre and Halfway. Yeah, it's really hard to tell what was there going by what's left today - as far as I can tell, the concrete floorpans of the houses seem to still exist today, although are almost all covered with a thin layer of earth and grass now, along the main flat bit. There's still a wee bit of wall and the remains of what someone suggested was a substation at the back of it, and a clothes pole slightly further up the slope near the back. There's also a curious wee memorial in the trees somewhere! Down by the river, where the rubbish is, there's a strange wee brick tunnel structure, no idea what it was. I'm not sure about the area between the bench and the railway, I've never seen any evidence of anything there, and given that they weren't too thorough about clearing away the remains elsewhere, I'd be surprised if they did so elsewhere in the site. An old map I saw once had a signal box marked near there. Really must post my pics of the place.